Europe has a slow, easy saunter where the rhythmic pace of life is at an elongated tempo. It is a state of being where people enjoy the simple pleasures – a leisurely walk, a cup of coffee or a meal. After my first visit at the age of 13 my worldview was rewritten, and I became entranced by the European cuisine and lifestyle. Since then I have made several more trips abroad, but in between my visits, I am always in search of a place that will allow me to capture that feeling – even if it is just for the afternoon. So, when Michelle Polzine opened 20th Century Café, a spot specializing in Eastern European savory and sweet treats, it had my attention. Set in Hayes Valley, 20th Century has all the underpinnings of a European café. The big band instrumental music humming in the background. The chalkboard leaning on an easel with libations scrolled across it. The antique brass light fixtures descending from the ceiling. The vintage accents transport you not only to a different place but also another time. When you enter the cafe the first thing that beckons for your attention are the assorted pastries, potato knishes, tortes and cakes strown across the marble counter top. Each of these meticulously created treats all inspired by Polzine’s travels through Budapest, Vienna and Prague. To start, I snacked on a pogácsa, a savory type of scone, that in this instance was made with cheese and bacon. With a tender texture that is somewhere between that of a scone and a biscuit, this cheesy nibble was the perfect starter. I then transitioned to one of the sandwiches served as a lunchtime special. Married between to two thick, crusty pieces of bread was a mixture of kale and sheep’s milk feta that was topped with a bright red Hungarian pepper relish. This seemingly simple construct was like a grown up grilled cheese with greens. 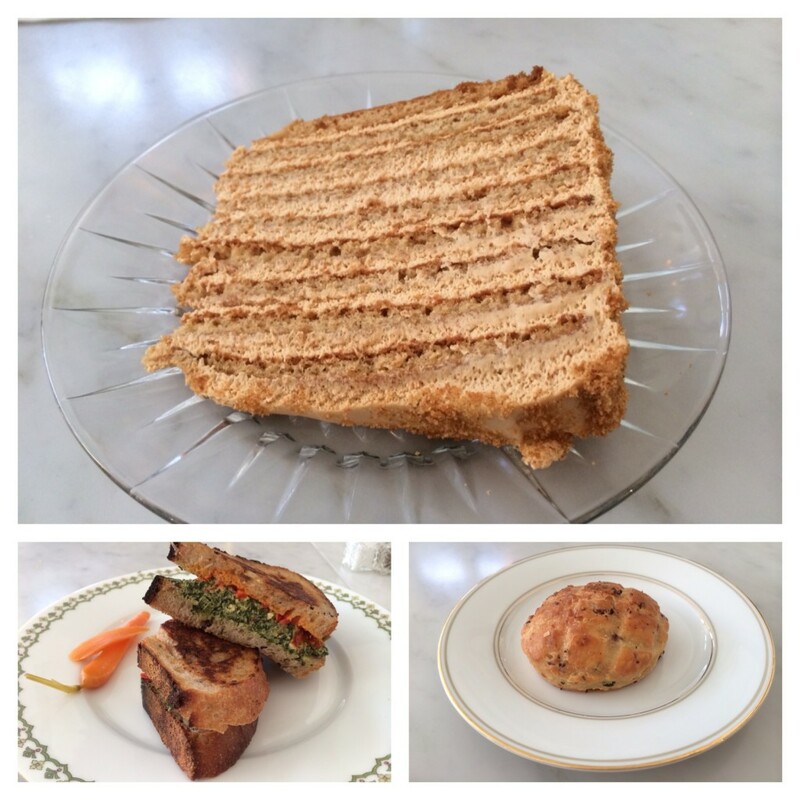 A trip to 20th Century Café simply wouldn’t be complete without a slice of the Russian honey cake (krasinski tortchen). Eating this multi-layer dessert is like floating on honey soaked clouds. The cake is light and spongy and coupled with a airy whipped frosting that strikes the right balance of sweetness. For that afternoon, I sat and let myself be in the moment. The ambiance naturally lends itself to being a place where you can linger a little longer than you normally do. And at just the cost of a Muni bus ticket to get there, 20th Century Café gave me that piece of Europe that I so often long for.